In addition to proper brushing and flossing, it is important to adjust your eating and drinking habits while wearing braces or other orthodontic appliances. 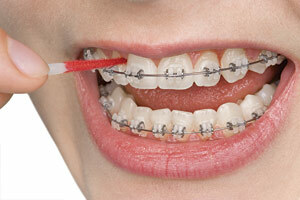 Some foods and drinks may taste yummy, but can be quite harmful to the teeth - especially with braces! Eating or drinking certain foods or drinks can cause permanent damage to the teeth. In addition to the foods listed above, you will also want to stay away from hard and crunchy foods to minimize broken brackets or damaged wires. Avoid biting directly into sandwiches, meats, and raw fruits/veggies. Instead, cut food into small bites and chew with the back teeth.